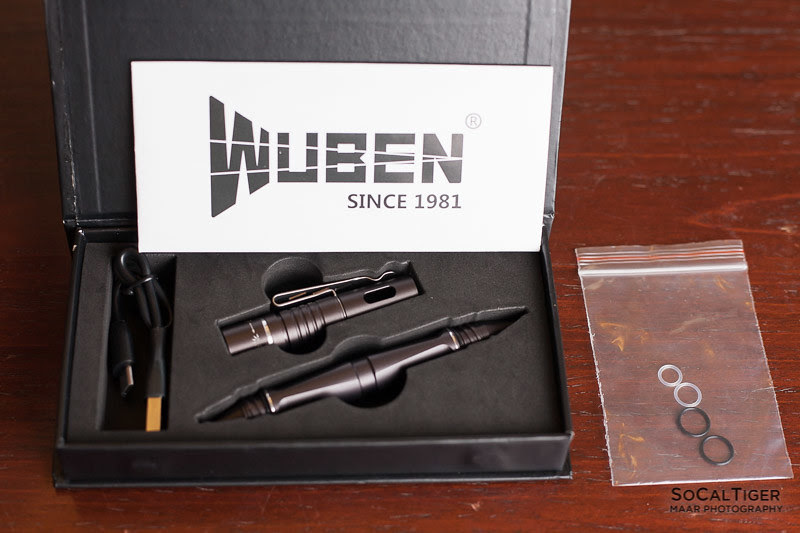 The Wuben TP10 is Wuben's "Tactical Pen". 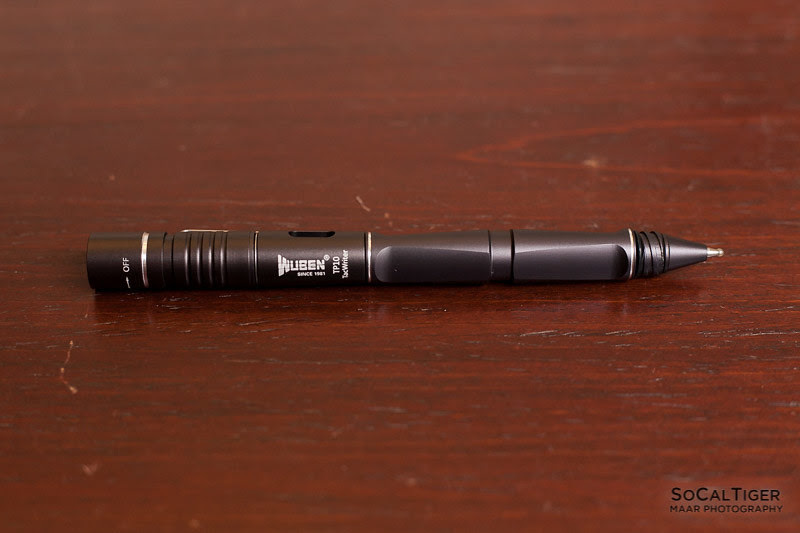 Utilizing a CREE XP-G2 emitter, the TP10 functions both as a normal pen (ink is refillable) as well as having a tactical point which can be used in emergencies (breaking glass, etc.) 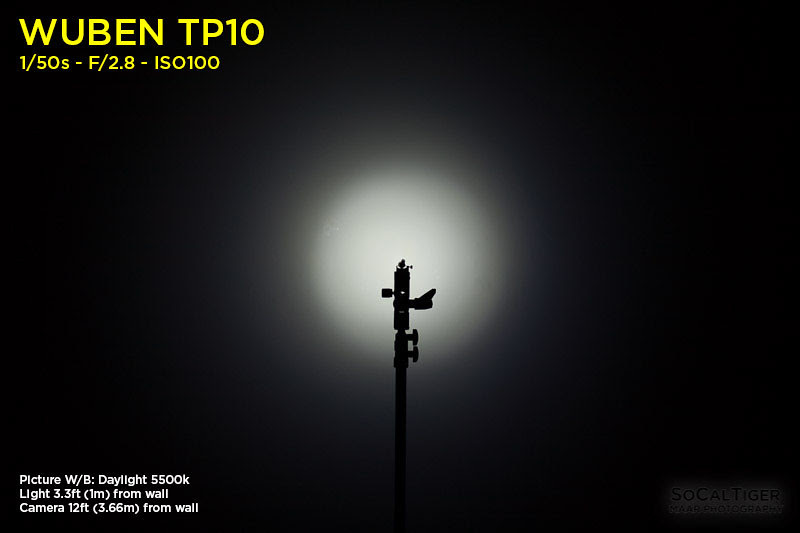 The TP10 is powered by a tiny 10180 battery (included). 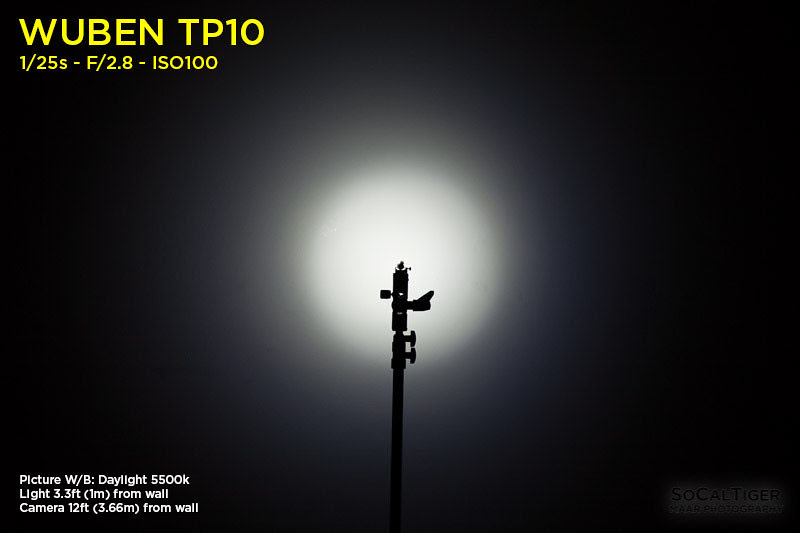 The TP10 can output ~150 lumens on High and ~14 lumens on Low. For convenience, the TP10 has built-in micro-USB charging. 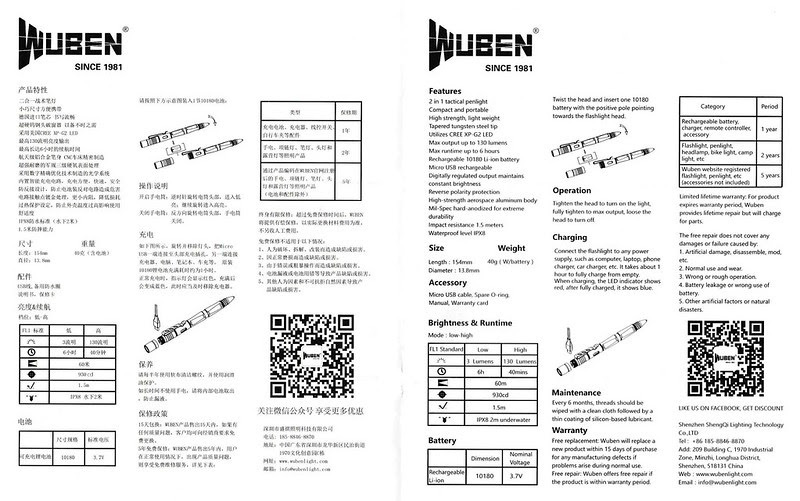 I was provided the TP10 for review by Wuben. 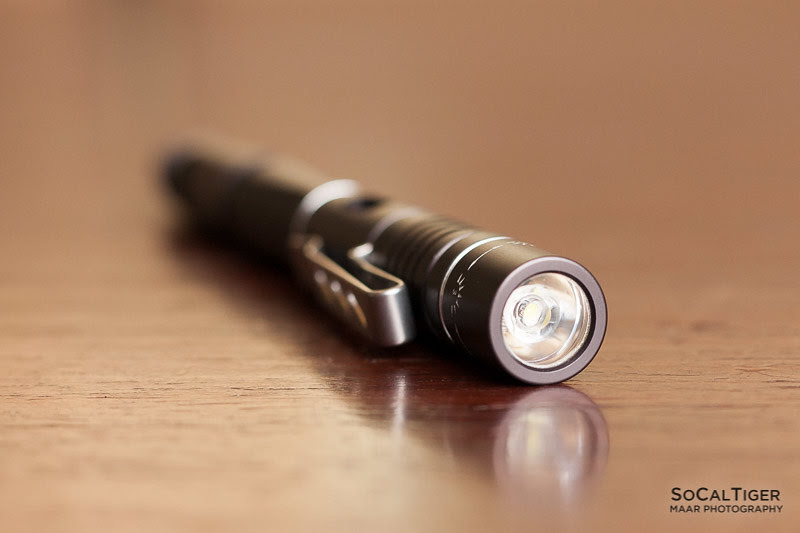 TWO SETTING MODES- Premium CREE XPE2-LED,Low light(3 lumens）and high light(130 lumens),3 in 1 tactical penlight,very unique and cool. I chose the "Dark Grey" color (the other option was "Champagne Gold") and I think that it looks really nice as a pen. 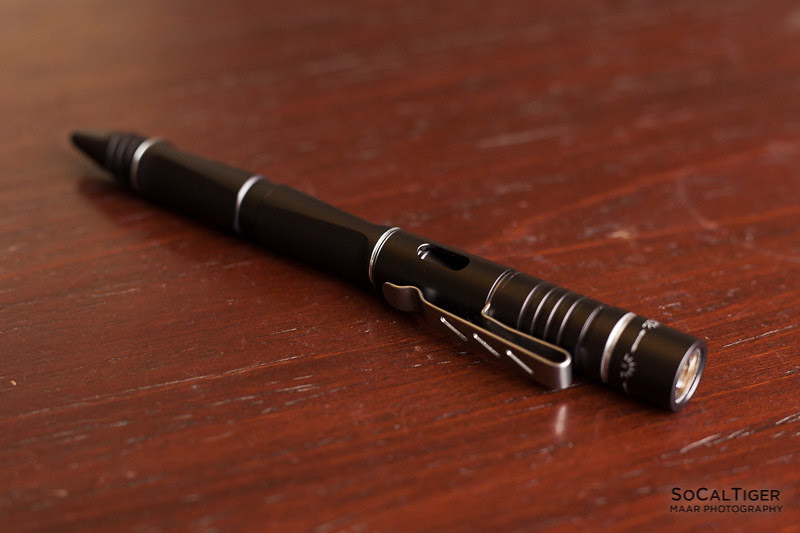 The anodizing has a nice sheen or luster to it and seems to be pretty durable, which is good for something which would be used frequently as an EDC pen. The pen has a nice clip installed on the cap side. Exploded view to see how everything fits together. Even closer with the pen part assembled. Cap and pen sides assembled. 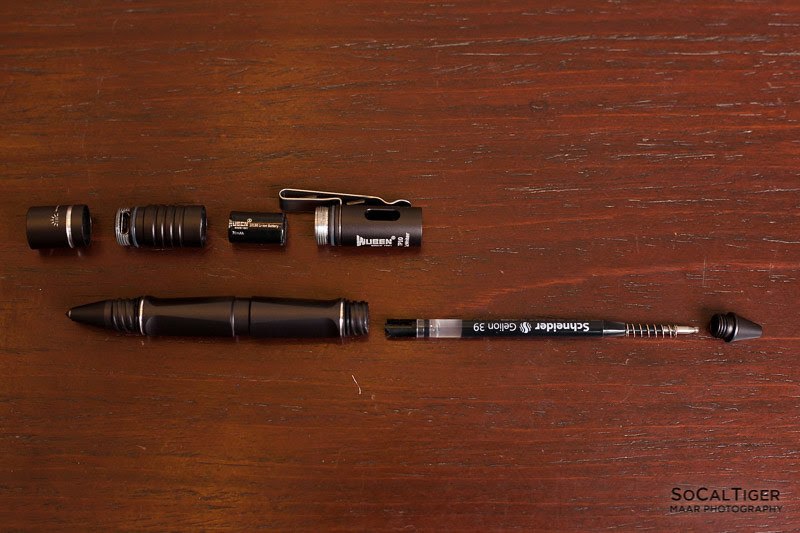 To switch between pen mode and tactical mode, simply change which way you screw in the business end. Color Temperature is 6200K (cool white) as measured using Lightroom Auto WB. Beamshots below were all adjusted to Daylight 5500K. Compared to Daylight, beamshots appear cold (but not purplish). In real life the beam appears cool white unless comparing it to other sources. 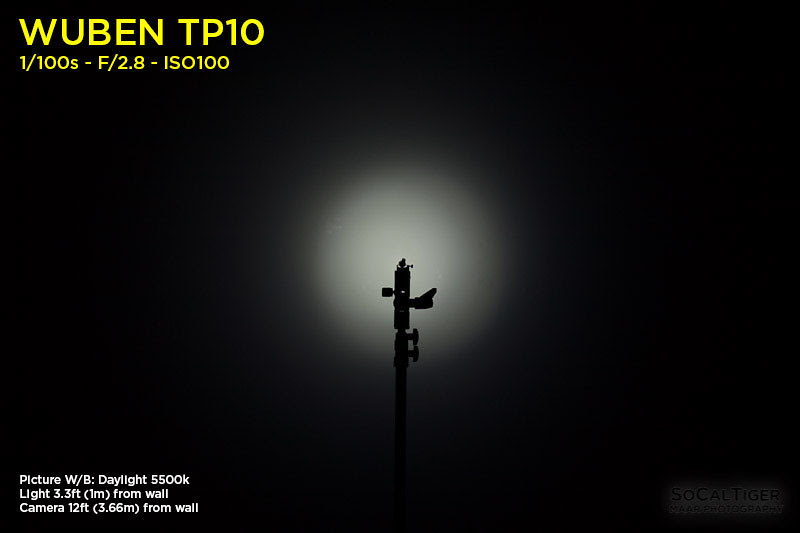 The TP10 comes with Schneider Gelion 39 ink installed. 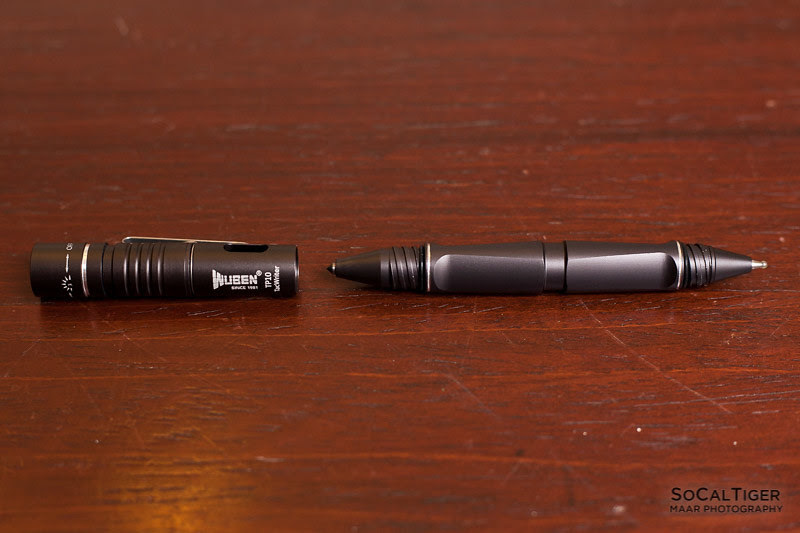 The ink can be refilled/replaced with any Parker-style Standard G2 which can be easily found. The TP10 has a built-in micro-USB port. When I initially charged mine, it took roughly 1 hour using the USB output from my desktop. While charging, the LED is red and it turns green when full. 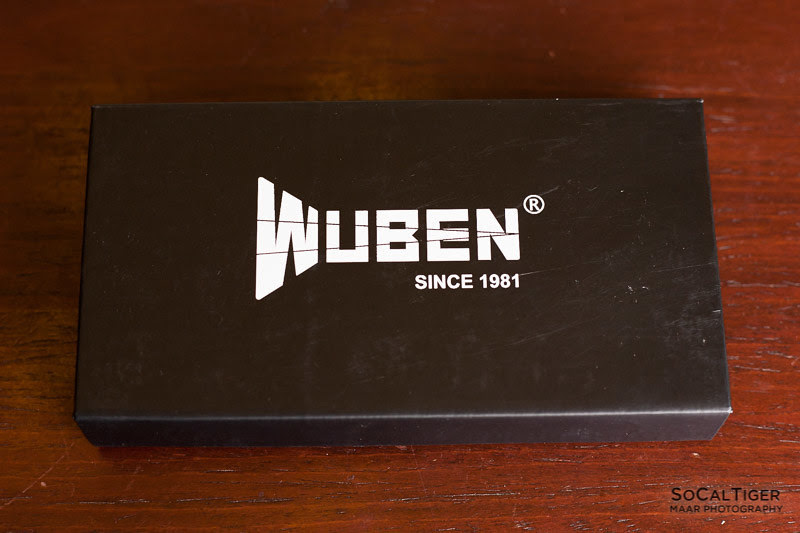 The Wuben TP10 includes a house brand 1x10180 rated for 70mAh. The light is turned on/off simply by rotating the top of the "cap". The light initially turns on "Low". Turning it further goes to "High". 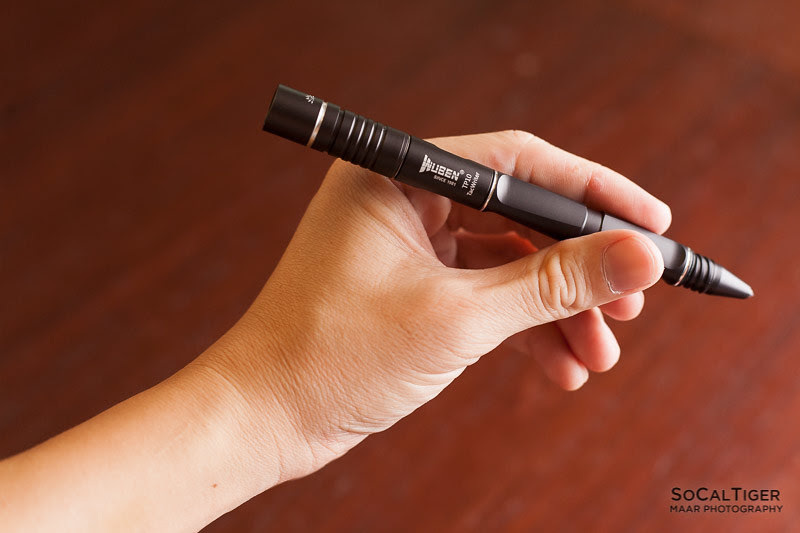 After a full charge, on High the pen was about 150 lumens at 30 seconds. Low was 14 lumens. 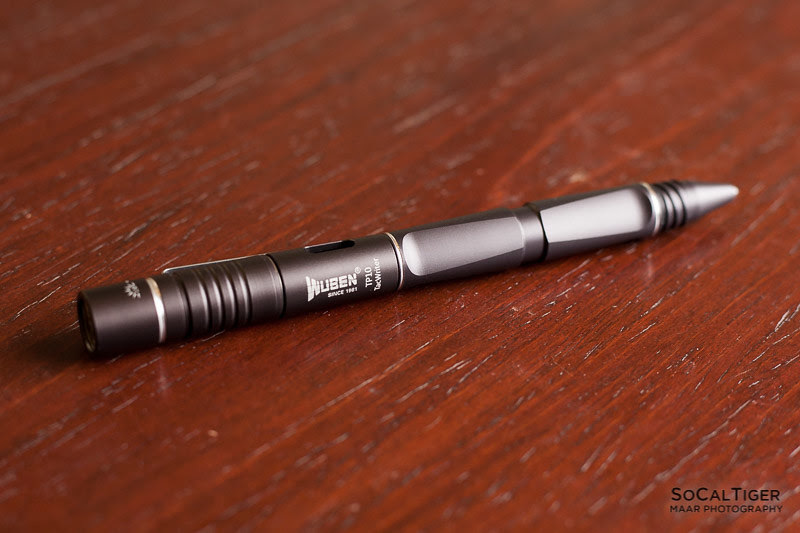 The Wuben TP10 is a really cool tactical pen, actually the first tactical pen that I've owned. The machining quality, style and anodizing are all very nice. 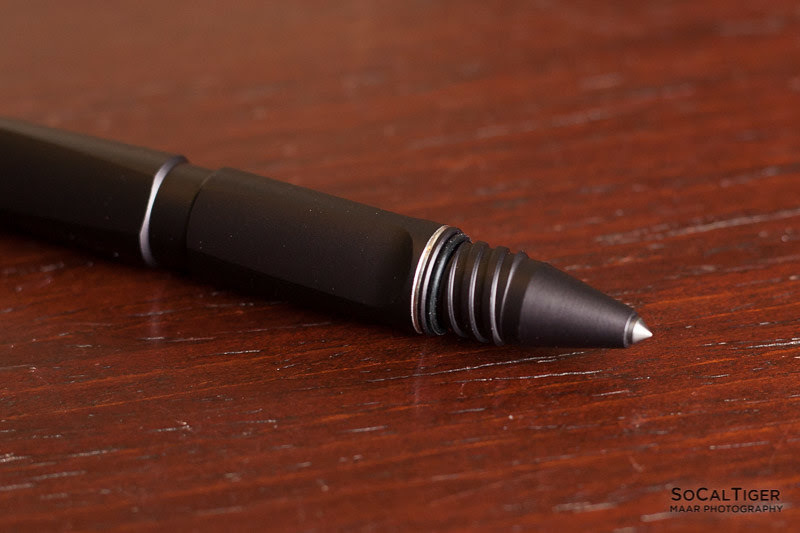 The appearance has a nice sheen to it and it looks like a professional pen - like something an architect would use and definitely something cool to show off to coworkers. I also suspect that the finish is durable and will last through plenty of daily use. Fortunately, I don't need to use pens often but this is the pen to carry around and to use in style when you do. 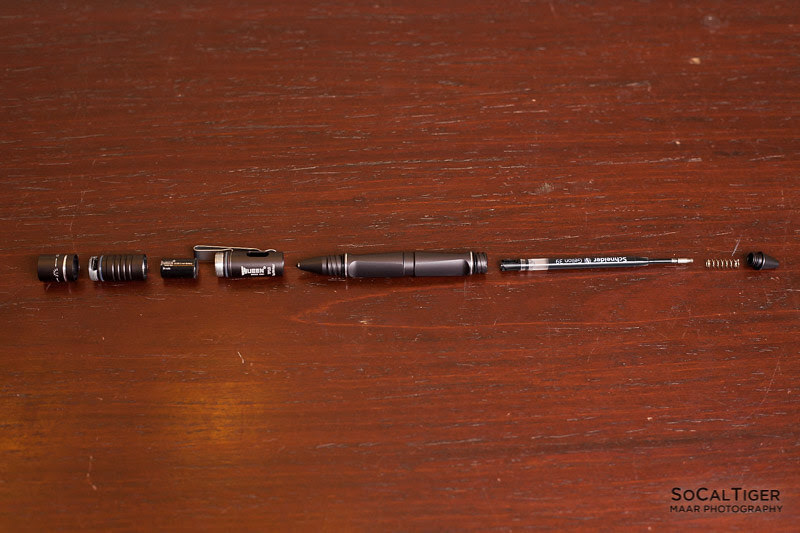 This is a great EDC which I've found is perfect to throw into my laptop bag to replace the normal pen that I used to carry. It is always there in case I need a pen, a light or the tactical tip. The light is nice and bright - 150 lumens on High is all that I would ever need in most scenarios for something like this. Even on low, it would be plenty of light to find my way out of a dark building during a power outage or simply to find dropped keys, etc. Pro-tip: The tactical point is also good for pressing in those tiny "reset buttons" on electronic devices. So, this is perfect for me. In an emergency, this could be used tactically for defense or to break glass. Then pen writes really well and the ink refills are very easy to find cheaply on Amazon or at an office supply store. 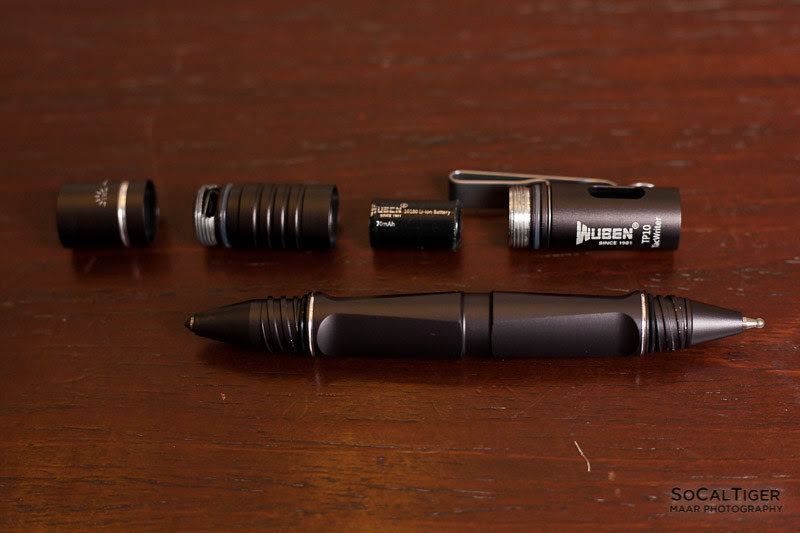 The only recommendation that I have to make this better was that I wish there was a small screw on "cap" for the bottom which you could put on either the pen or the cap when not in use instead of having to unscrew and rescrew the pen in storage position and so that the tactical point was not always exposed. Of course, the downside to that design would be that an extra small cap would be easy to lose and it would also make swapping ends more of a hassle. Aside from that, I would also (as always) prefer a warm white version. Nice pics and review. I love mine, but would really love it with a cap! Yes! That is the one thing that they can do to improve it. Thought wuben was going to do a group buy. Maybe they didn’t get enough interest? But, it looks like it may have stalled. I also have one of these and love it, I use mine every day. I have to agree about the cap though, my only suggestion as well. Annodizing is decent, but I do have a few nicks and scratches on mine from daily use. No bid deal, just adds character. 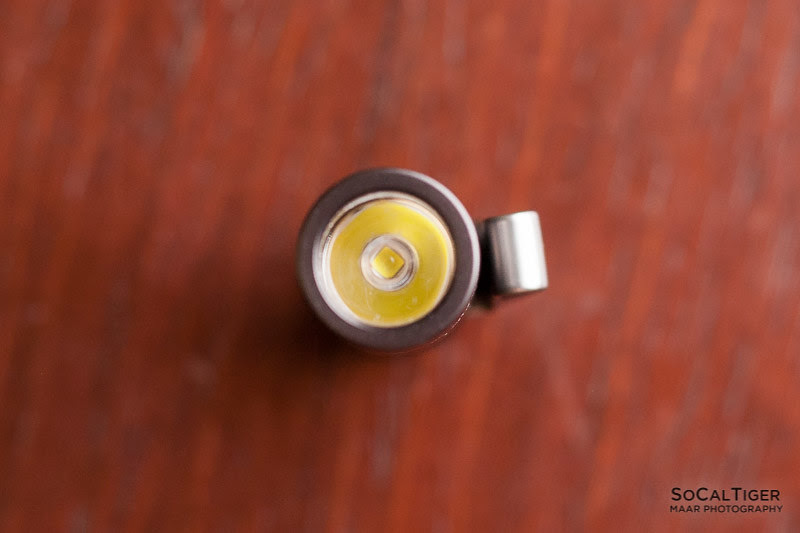 I did an emitter swap on mine to a 3000K 80+ CRI XP-L2. Looks wonderful in warm white. I almost never use high mode, I have real flashlights for that, but it is nice and bright if I ever need it. For those curious the “driver” is just two resistors, one is used for low, both are in parallel for high. I forget the exact values. High mode just presses a small tactile switch button with the tip of the battery holder to switch the second resistor in. Not regulated, but this application really doesn’t need it. Oh, the tactical point is also handy as a metal scribe for marking out work in the machine shop. +1. That’s what I have used it for. ..and have to add that the included gel roller refill is very good for writing. 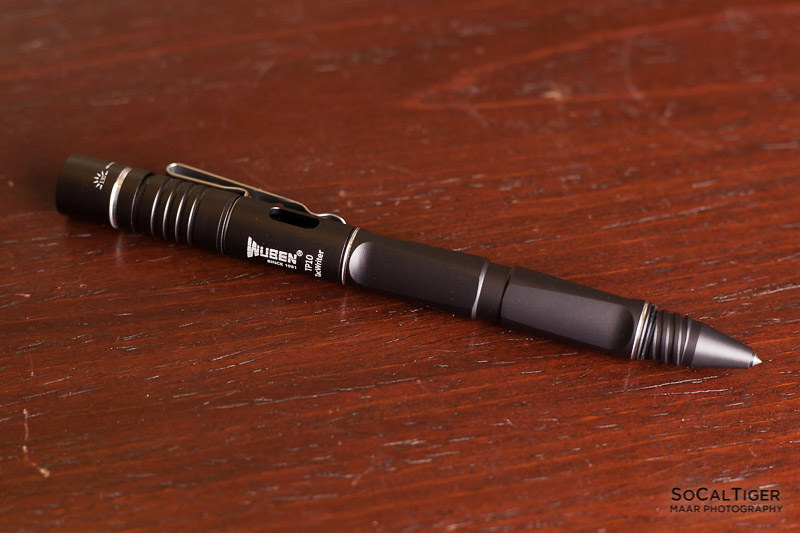 So a tactical pen that really works as a pen! How cool is that? Where did you get the cap from? That’s exactly what I would want for it. My guess is that it will become a standard accessory if (/when) people ask for it globally. OMG that cap is perfect!